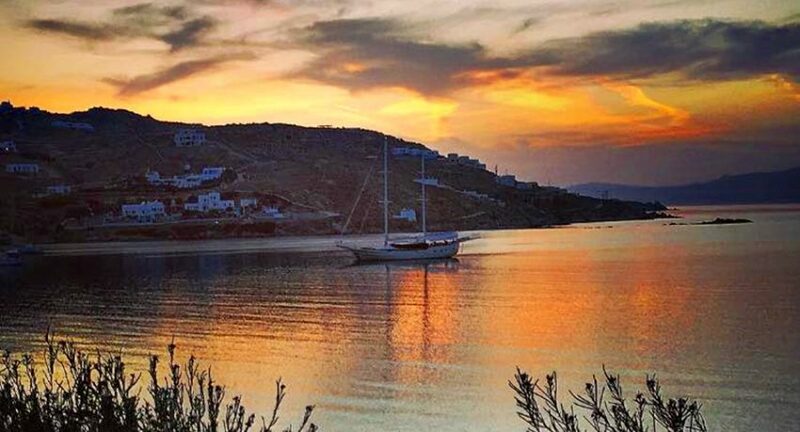 Korfos beach is a small bay located just before the village of Ornos, at a very close distance from Mykonos Town. During the last years is one of the upcoming tourist areas, since there you can find everything you want in very short distances. From hotel units and tourist accommodation, up to shopping center with several shops, cafes restaurants and bars. It is on the north side of the island and usually people do not prefer to swim there because of the strong winds that blow frequently on the island, except when there is apnea or when they want to have fun doing some of the water sports there. Korfos was in obscurity for many years, because of the winds and the bay location, however the last years and in particular since 2011 that Brazilian Alex Kuzolitz and his team Kite Mykonos took action, is a paradise for lovers of windsurfing, kitesurfing and generally of the extreme sports, because in most cases strong wind blow, called meltemia and in combination with the shallow bottom waves are generated. This particular sport is ideal for advanced riders and for beginners. In Kitesurfing Mykonos there is a large and experienced team of certified trainers, who care for your safety and supply you with top quality equipment, whilst they ensure that you get the best possible learning experience. There is also a launching – lifting ramp for boats on the west side of the beach, which makes it a reference point for those who want to go for a walk on Delos or in the surrounding beaches. The beach access is easy from the main provincial road Chora – Ornos. Distance from Mykonos Town: 2.5 km.